… walk into a store and make a bee-line to the things that fit and flatter you. … quickly and painlessly put together an outfit that makes you look and feel beautiful. Every day. … clear the clutter out of your closet and only keep the items that make you look fabulous. … know that what you’re wearing fits your current age and stage without looking dated or frumpy. Are you looking for a fashion "Safe Space"? A non-judgment zone with a group of fun, supportive women (and one opinionated stylist) who are all on their own path to Style Confidence? Then we want you here! There is no place like the Style Confidence Club on the Internet (probably the world). It all starts with getting to know you. 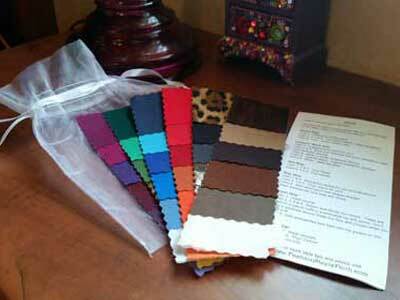 I do a Body Type & Color Analysis and teach you what each means for you. This not only gives you incredible insight into what will fit and flatter you, but allows you to speak the "language" of the club. And that's where the real fun begins! 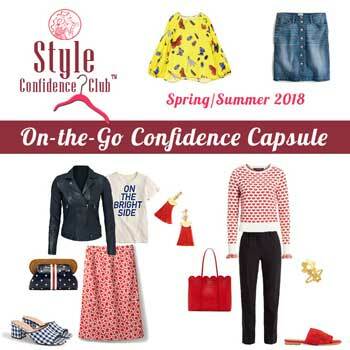 You'll have access to the 8-part Style Confidence course, Private Facebook group, weekly webinars, contests, quarterly "confidence" workshops, seasonal Confidence Capsule Wardrobes, and more. We'll talk shopping, closet organization, fit & flattery, body type, color, accessorizing, beauty.... OK .... I'm getting too excited now. Lifetime Club Membership is only $199! If you decide you'd like more one-on-one time with me, I also offer personal, virtual styling services. That's what I love most! I will analyze your unique Body Type and offer suggestions on how to shop for, style, dress and flatter your unique shape. Next, I will analyze your photo, eye color, hair color, and complexion to determine your dominant color characteristic. I’ll be your guide on an 8-Part, self-paced journey to Style Confidence. See section details below. This group offers a supportive community of women who are all working on enhancing their own style confidence. Get exclusive content and support. The Club is constantly growing, so look for new resources weekly, including downloadable cheat sheets, webinars, and more! Discover (and Love) Your Body Type: I will analyze your unique body type and offer suggestions on how to shop for, style, dress and flatter your unique shape. Get Glowing With Your Color Code: Discover a simple system that will guide you in choosing a color palette that suits you best, and use it to find flattering makeup, clothes and accessories. Express Yourself (and Your Lifestyle): It's time to have fun, expressing yourself with fashion and choosing pieces that suit your lifestyle. Conquer Your Closet: Edit, clean and organize your closet and make it a haven where getting dressed is a pleasure. Learn how to sort through your items and discard those that no longer work for you. Confidence in a Capsule (Wardrobe): Create a workable, stylish capsule wardrobe using items that you already have, and then combine these items with a collection of basics that can help you create multiple daily looks and simplify your life. Shop With Confidence - Online and Off: Overwhelmed by the prospect of walking into a store and not knowing what to buy? I will show you how to shop like a stylist, so you make the right choices for your body type, personal style and your lifestyle, every time. 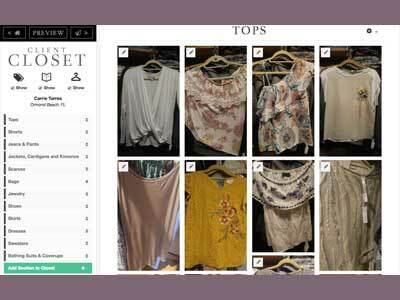 Also, learn how to shop online for the best fit and style, all within your budget. Accessorize With Ease: From tying a belt to cuffing your jeans, we’re going to get into the details about how to finish any outfit with accessories. You’ll learn the secrets to cuffing a shirt, tying a scarf, selecting shoes and adding the right jewelry and accessories to any look. 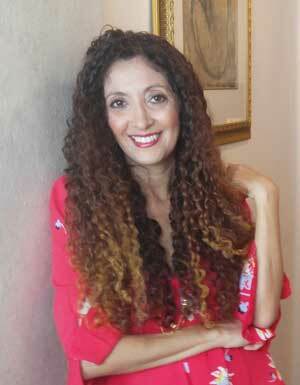 Beauty-Full You: Make the most of your hair, skin and makeup, and learn simple tricks and easy routines that make looking and feeling beautiful second nature. Here's your complete wardrobe for the season, featuring a shopping list with prices and links to your favorite retailers as well as a lookbook full of daily outfit ideas that reflect your style and respect your budget. The outfits were specifically chosen and researched by me (your personal stylist!) to give you the most versatility and mileage in your wardrobe. Within 7-days of purchase of the DISCOVERY OR BRONZE membership, if the Club is not for you, we will issue a full refund, with one caveat: You must have completed the Body Type Analysis and Color Analysis. That shows me that you’ve given the course a chance. I want to make sure you have a valuable experience. 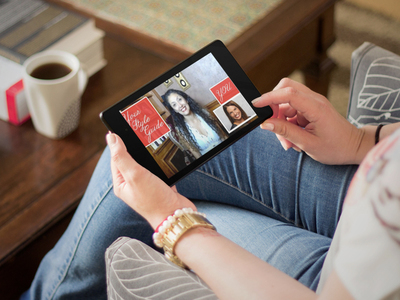 If you'd like more one-on-one, virtual, personal styling services, I'd love to help. The packages below include lifetime Style Confidence Club membership. Experience the complete 8-Part journey to Style Confidence, with my guidance. Includes a video call, private messaging, 2 yearly seasonal Confidence Capsules, and more! 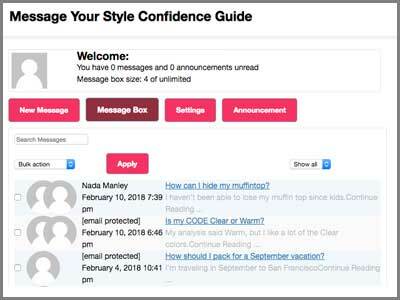 Personalize your Style Confidence journey with ongoing of virtual, private stylist support, two 45-min video calls, color swatches, Virtual Closet Management, All seasonal Confidence Capsules, and more! Not ready for Club Membership? Become a FREE Club Subscriber! I’ll help build your Style Confidence with weekly style and beauty advice. I’ll also send you my “How Not to Dress Old” Style Guide and the 15-Piece Essentials Capsule & Lookbook. I've worked with hundreds of women, gone on countless shopping trips and overhauled hundreds of closets. I have developed a system that can help any woman, regardless of her age, her weight, her body type, or her budget, develop the style confidence to feel and look amazing, every single day. That system has become the Style Confidence Club! The Style Confidence Club & Course guides you through my simple, fully-supported, step-by-step process, surrounded by a supportive community of women who are also finding their way to style confidence. Join us today!